Last year I received this 9’6” Robert August for my birthday. 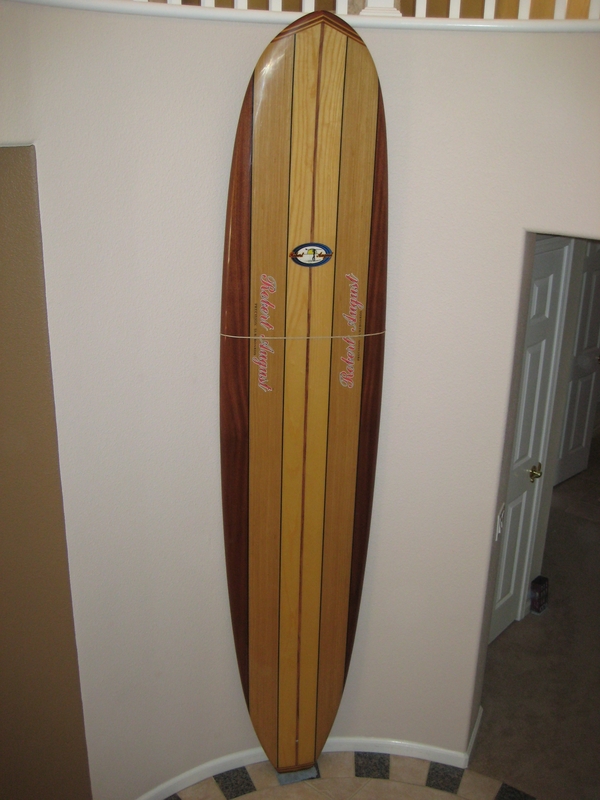 Purchased from Pismo Beach Surf Shop, it is ash, oak and mahogany with a triple fin configuration. The board utilizes a 60/40 rail configuration which, in combination with a nifty tear drop concave conveniently placed under the nose, should greatly enhance nose riding. I can not contest to that as the board is a display board in our foyer, has not been waxed and will not be put into the water any time soon. This entry was posted in Quiver and tagged Robert August, Surfboard. Bookmark the permalink.